HeyPlantMan! Exotic Tropical Plants from St. Pete FL: Succulent Plants in St. Pete highlighted today ! 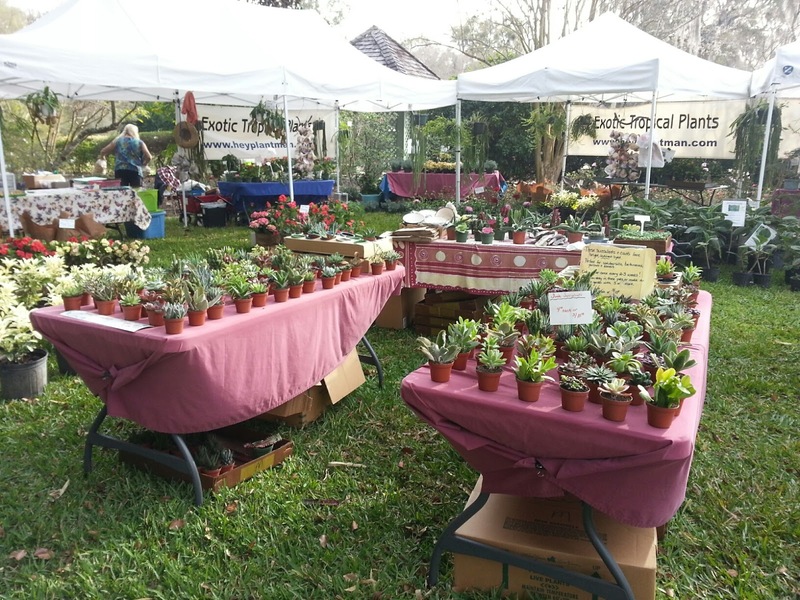 Succulent Plants in St. Pete highlighted today ! Greetings again, this is my second post of the day. After posting early this morning, I opened my Tampa Times and saw a great article about Succulents and how this type of gardening has really hit the masses the last couple of years and just increasing in popularity. And boy, are they right ! The article mentioned O'Berry Succulents who is a popular vendor at area markets with their beautiful Put-Together Succulent and Cacti gardens, as well as their whimsical gardening using succulents planted in, or used with inanimate objects, such as shoes, dinosaurs, cork and other such fun stuff. 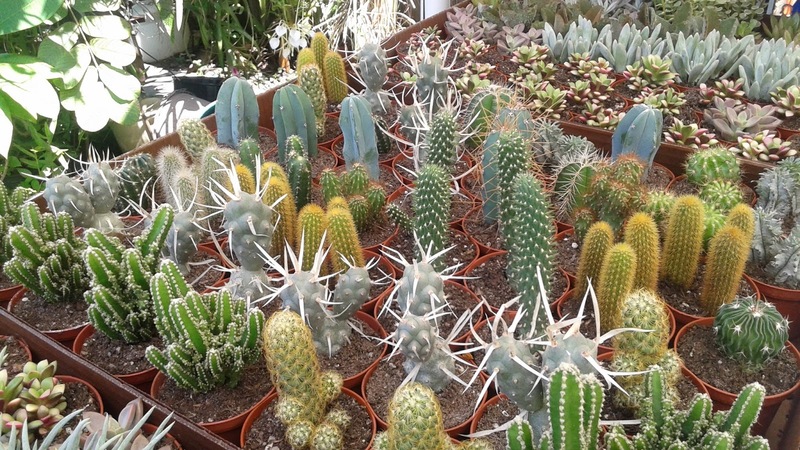 I found out there is actually a Facebook group called "St. Petersburg Succulent Addicts" ! 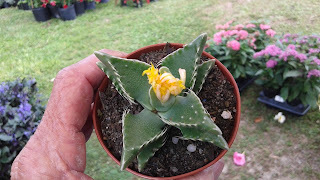 Of course, I asked to join the group online immediately and saw many other new people who just found out about the group too, and were eager for info and care about these great plants.I love to be part of groups that share info, pictures and their experiences and joy with succulent gardening. 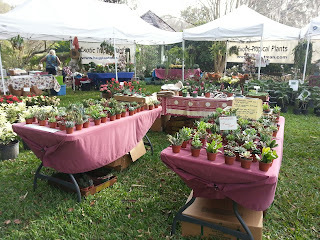 For the past 3 years at Saturday Morning Market, downtown St. Pete, as well as the popular Spring Plant shows in our area (like Leu Gardens, Tampa Greenfest and Green Thumb Festival, Armstrong Nursery have been carrying the individual mini succulent and cacti plants, and yes, they are popular and have really helped us to grow our business. We have found for a majority of our customers, they want to DYT, or Do It Themselves ! 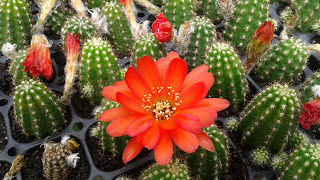 That is why we focus on just providing the individual plants they can use with their own inspiring ideas. 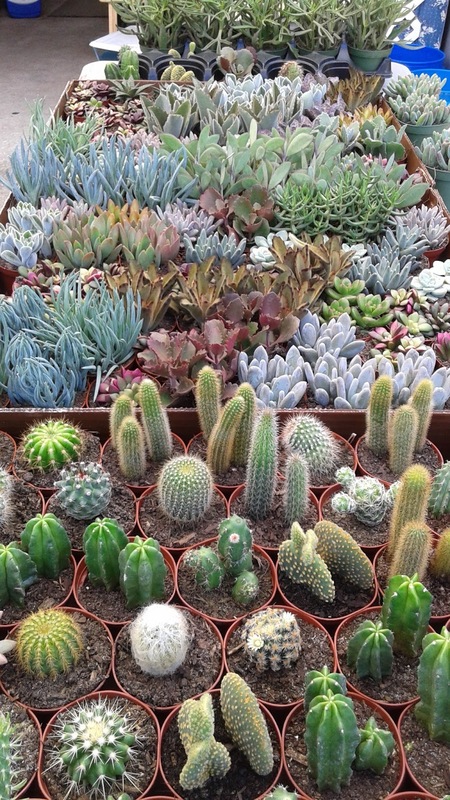 On average, we bring 500 plus mini succulent and cacti so you have loads to choose from. 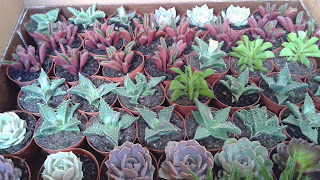 Also, as the article stated, the mini succulents are very popular for gifts at baby and wedding showers, wedding receptions and we have had the pleasure and privilege of providing the plants for many events such as those too. We focus on many types that you don't normally find at the Big Box stores, and we spend a lot of time with our customers teaching them about care and the growth. Besides conversing with our customers, we make sure every one goes home with a care sheet to remind them about 2 very basic things that Most people want to know - Watering and Where the heck to put them !! First, these plants can really be grown anywhere, but at this mini size, they are best NOT in direct sun and can be readily used indoors (think windowsills, bright bathrooms, sunny rooms) and we have had many a customer tell us how they have really brightened their homes, dorms, and offices. Outside, they will thrive in Bright In-direct light - so think porch/patio, under awnings, protected walkways etc. Second, and this is OUR personal recommendation based on our knowledge and experience - we only recommend watering once every 2-3 weeks, so they are very low maintenance. 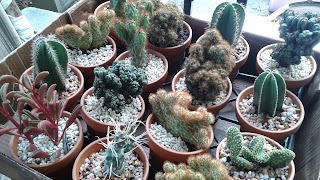 You can keep the mini plants in their little pots for a long time, and some types will grow faster, or taller than others. You can simply trim them, or, move to a larger container at some point. The trick to watering is to water the soil part thoroughly (much succulent foliage does not want, nor need watering) and then let the soil dry out completely. 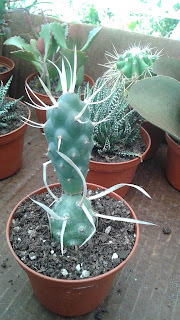 We have found that "spritzing" with a water bottle etc, is really not enough to water your plant successfully. The easiest way to water the plant in its mini pot is to simply put it in a sink, or a plastic pot where the water level comes half way up the pot. In a couple of hours, the water will seep up from the drainage holes (more about that later) and you will see that the soil top level is moist. At that point, removed the mini plant from the water source and place on paper towel to let it drain, then put your plant back to it's home place. 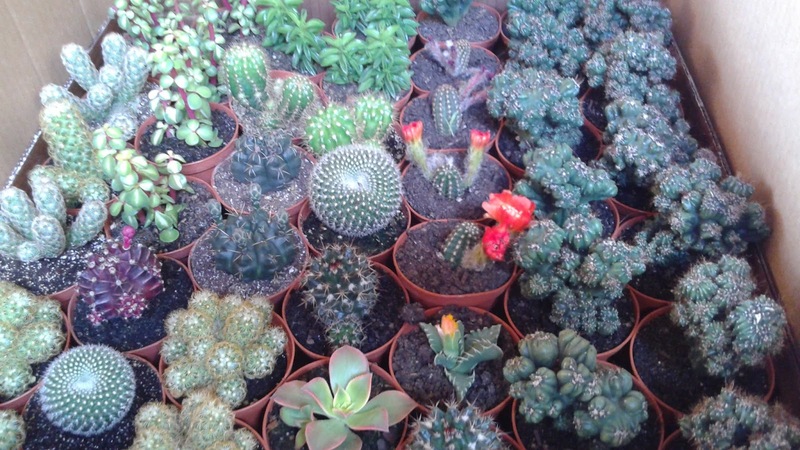 For container watering, the important thing is for your container to have drainage holes. I see many of cute pot at the Dollar Stores etc but they have no holes. Truth is, you can plant it like that and it may last for a while - but in the long term, it will not. Either the plant soil will not get watered enough, or built up watering will cause mold and mildew at the bottom of your container. Mitch is quite adept at pulling the ole drill out to put holes into containers that I love that didn't have the drainage and it does not take any special, expensive drill bit ! 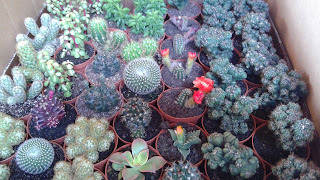 Here's some pics of our plants being readied to take to Saturday Morning Market tomorrow ! 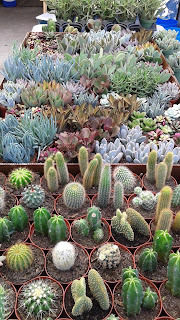 We bring on average, 500 plus mini Succulent and Cacti to Sat. Market every weekend, so you have loads to choose from. 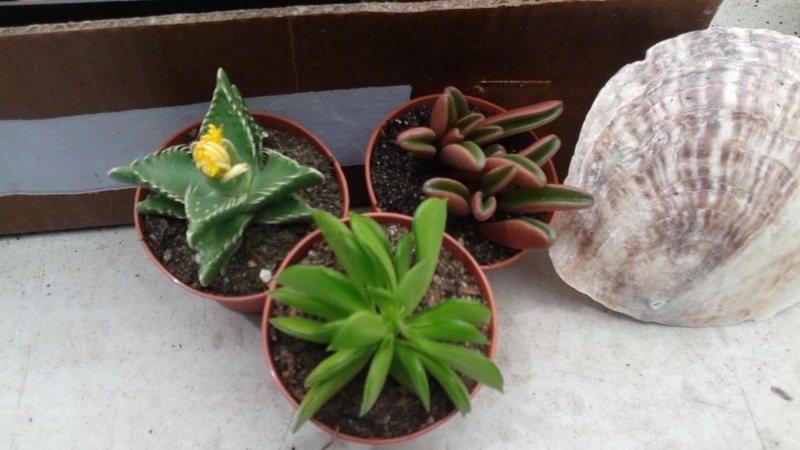 One of the newest mini succulents available, called "Tiger Jaw". It is a late afternoon/evening bloomer and the bloom looks like a large daisy flower that practically covers the whole foilage ! It will continue to bloom for 3-4 days and then starts producing babies to start the process again. Along with the Tiger Jaw at right, some of the newest popular specimens, the Red Pepperomia and the "Propeller"
It is amazing how large of bloom you get off such a teeny plant. 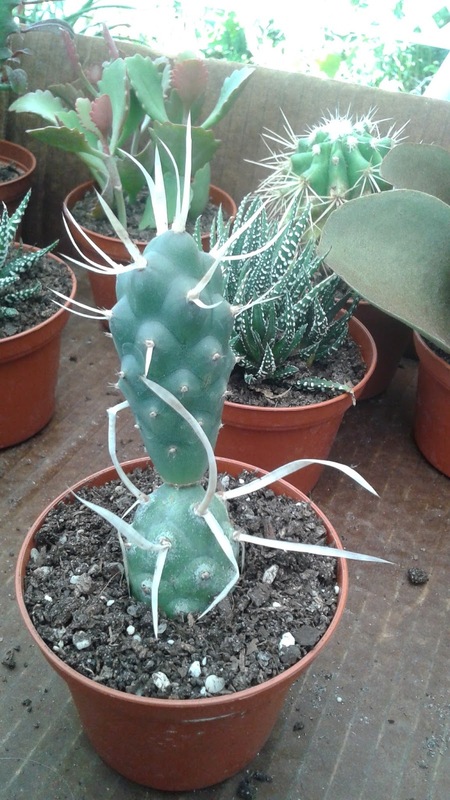 Our most popular size is the 3 inch potted specimens. They are the perfect size to use alone, or as a grouping and they don't take up much space. 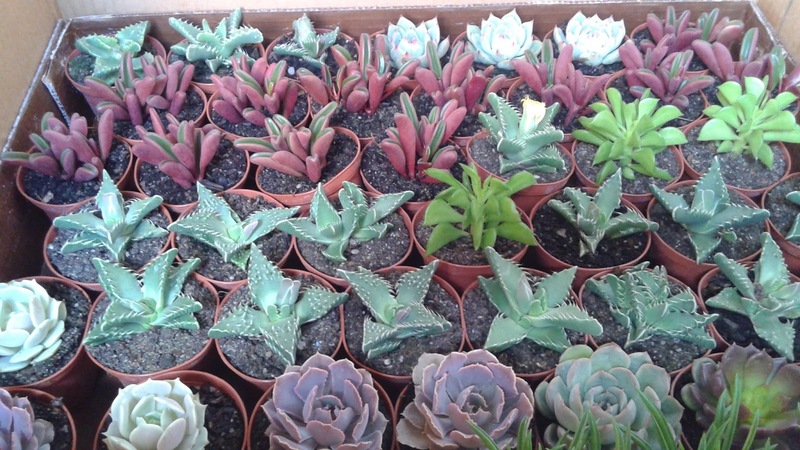 Well, it's time to get back to loading our trailer for market and we hope this post finds many new people that are eager to get into Succulent gardening and we are there to help!